Be a Dahlia, Won't You? 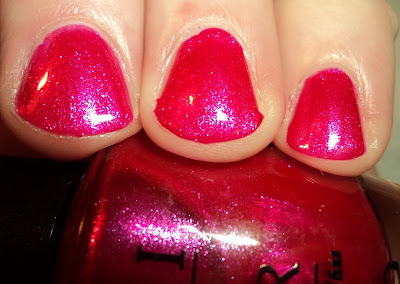 - bright fuchsia shimmer. In the bottle, this one reminded me of Ali's Big Break. However, it didn't have the metallic sheen. Nonetheless, this is a beautiful color. It also has a subtle blue flash (as you can see in my picture). Formula was great. 2 coats. 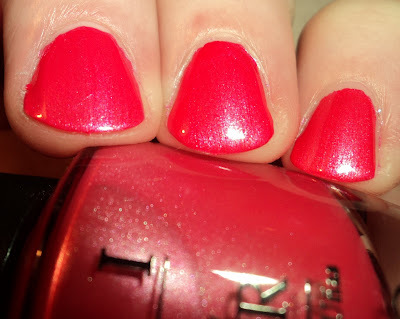 Come to Poppy - Coral pearl. This one is a hard one to describe. It's not peach, it's not pink, and while I think it's a coral, it also reminds me of those salmon pink crayons from the Crayola box. Honestly, when I put this one on, I thought I was going to hate it. In fact, after I put it on, I hated it. Then I took the pictures and I have to say that I really like it. It quickly grew on me. The formula on this one was fantastic. It glided on the nail. 2 coats. I Lily Love You (over Be a Dahlia, Won't You?) 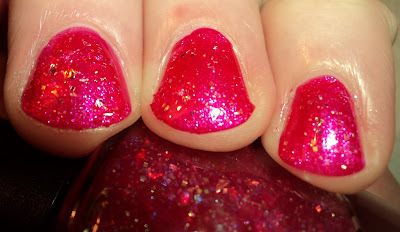 - Holo flakies in a pink clear base. I was a little saddened that this one wasn't opaque, as this was the one I was most excited for, based on the PR pics. Nonetheless, it's a nice top coat, especially over Dahlia. It reminded me of a pink, more functional, version of CC Covered in Diamonds. Also, over Dahlia, the gold tones in the flakies really pops. One coat over the base. Play the Peonies - pale pink pearl with silver micro-shimmer. This one is crazy pretty, and I really wasn't expecting much from it. However the color is beautiful. It's pink, but it almost looks like a colored white, if that makes sense. The finish is pearly, not frosty, which doesn't age my hands. And the micro-shimmer is subtle, but gives depth to the color. This one really made me wish I had darker skin and pretty feet, as it would look amazing as a summer pedi. 3 coats. All in all, I really liked it. Dahlia and Poppy are beautiful, as is Peony. I think Lily is a bit of a miss, as it's not really usable on it's own, but as a TC for brighter colors, I think it works. It's a nice collection. Certainly nothing revolutionary, but it's pretty for summer. Love your swatches! I really want I Lily Love You. I'm totally lemming come to poppy! It looks gorgeous, thanks for the swatches!